As I wait and wait and wait for our next adventure abroad (it seems interminable), I console myself with mini escapes for the weekend. And while a three-day jaunt to San Diego or Vegas can’t compare to a half-month foray into another continent, I still get excited, planning what to bring, what to wear, what to do. July was a big mini-escape month for me. Family came into town, and we all got together in an Airbnb for a weekend of sun, surf and reconnecting. As my nieces and nephew get older, I really treasure this time, especially with my oldest niece, who is on the verge of teenage-hood and starting to ask me about skin care and makeup. It’s something I love and bemoan (stop growing up so fast!) at the same time. So after combing through a gazillion beauty samples, here are some of the best I can’t live without for weekend getaways. Sulwhasoo’s Perfecting Cushion was as much a constant companion in Turkey as was bottled water and a hat. Number one on my list is always sun protection, and beauty brands have really stepped up in terms of making shielding my precious skin from UV rays easier than ever. Oils, sprays, powders — you name it, there’s a sunscreen formulation for it. 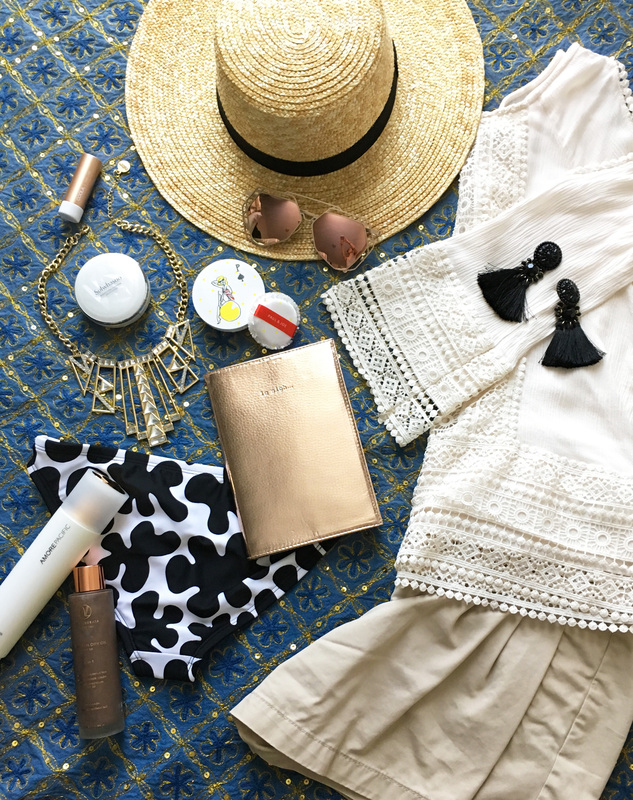 (AmorePacific’s Resort Collection Sun Protection Mist is handy for the beach and looks super elegant with its frosted white and gold packaging.) But my all-time favorite, of course, is a cushion compact, and the holy grail of cushion compacts is Sulwhasoo Perfecting Cushion. 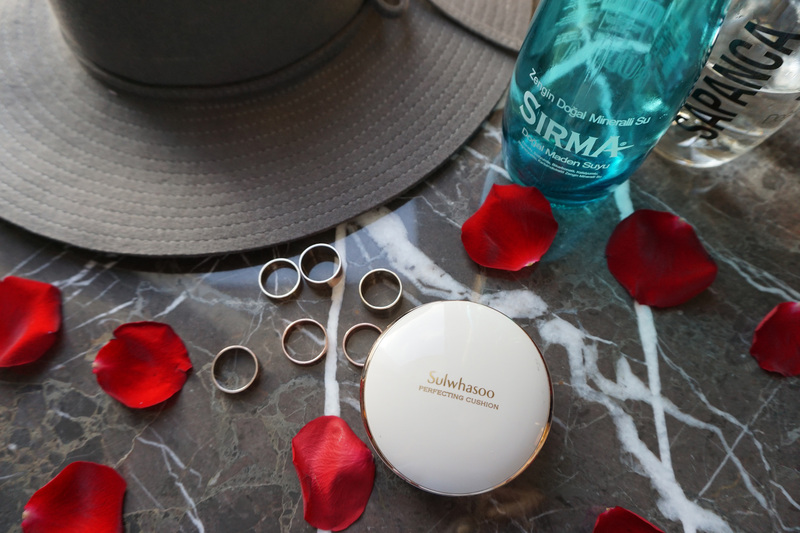 I’ve taken Sulwhasoo’s Perfecting Cushion with me to Turkey, Korea, Thailand, and Cambodia, all countries with some serious heat and sun rays. Not only have I never come back burned or with sun damage, the cushion makes it a snap for me to get ready in the morning, whether on a creaky wooden gulet boat on the Mediterranean or in a tiny studio in Seoul. It’s easy to reapply throughout the day (for a boost of coverage and sun protection), and it’s hydrating, which is something I really need to combat the drying effects of traveling and stress. And now with the new Brightening version available, I can combat potential hyperpigmentation and sunspots while I protect. I also have to carry a lip product with me due to my ever-dry, always-chapped lips. It used to be a lipgloss, but ever since I discovered Coola’s Mineral Liplux tinted lip balms with SPF, I apply them religiously. They give you just a hint of tint and go on matte, which is a nice on-trend perk. I also love that they protect my lips from UV rays, an area I have to admit I’ve been careless about protecting in the past. Last but definitely not least, I have to make sure that my legs are not the normal greenish-white shade they are all through winter. As soon as temps rise above 70 in SoCal (read: nine months of the year), I start applying self-tanner on my legs like it’s my religion, so I’m pretty familiar with what works and what doesn’t, especially because I loathe that self-tanner smell as well as the blotchiness that comes with fading. What I’ve learned is that a gradual self-tanning lotion starting in March works well to subtly and gradually give my legs enough color to prevent blinding everyone. The longer you use it, the more deeply the color sinks in, so by summertime, my legs are a nice tan hue that doesn’t fade quickly. I prefer St. Tropez Gradual Tan Classic Body Lotion in Medium/Dark for its non-DHC scent, hydrating formula and nice, natural shade. Side note: I’ve always had a problem with blotchy fading until I started exfoliating my legs with a loofah every time I shower. It sounds counterintuitive, but exfoliating the dead top layer actually helps reveal the skin underneath, which is also colored by the self-tanner. By doing this, I never have splotchy fading anymore. By the time we’re in the swing of summer, my legs have a nice glow, but if I want to take my color up a notch before a weekend getaway, I’ll use a straight-up self-tanner. I prefer mousse formulations because they’re so easy to apply and don’t streak as much, like Vita Liberata pHenomenal 2-3 Week Tan Mousse. And for beach days, I love that Vita Liberata has a 3-in-1 Marula Dry Oil that not only gradually self-tans but provides SPF 50 protection as well. It’s pure genius. What do you take with you on your weekend getaways? Hey Angela, have you tried the gradual tanning lotions? I apply those (both St. Tropez and Vita Liberata) like every other day all summer long, and I love it — no splotchy fading (exfoliating regularly helps), no streaking, no stench, and the more I use it, the “deeper” the color sinks in. I think my legs are so white (they’re the palest part of my body), anything will work. I tried some long ago (but not St. Tropez or Vita Liberata). The ones I tried were still faintly smelly. I have a terrible nose except when it comes to that self-tanning smell 😖 Is either ST or VL any better when it comes to the scent of the gradual tanning lotions? I toooootally used to stink like crazy with other gradual tanning lotions and thought it was just something I had to live with. But St. Tropez (I use medium/dark) and Vita Liberata gradual tanning lotions have BY FAR the least offensive smell. I would honestly say that unless you’re sweating like crazy, there is little to no self-tanning smell. It’s definitely worth a try and a product I buy again and again. Thanks 😀 I think I’ll give St. Tropez a shot. I admit I’ve been suuuuper lazy this summer and haven’t yet broken out the full-strength stuff. But I miss having tan legs. I’ve found 25 is the perfect shade for me, which at first alarmed me because I tend to be a light-medium skin tone (though my face is darker than my neck and the rest of my body — thanks, sunspots). A cool trick I learned from a celeb makeup artist: Use a lighter shade cushion on the high planes of your face (top of cheekbones, forehead, down nose, at chin), and then a darker one (maybe one that matches your skin tone) everywhere else for a natural strobing effect. That’s what I do with products that aren’t the right color for my skin tone. Also, you can spritz a mist (or add a drop of oil) on your rubycell puff before applying — maybe that’ll give you a boost of moisture?